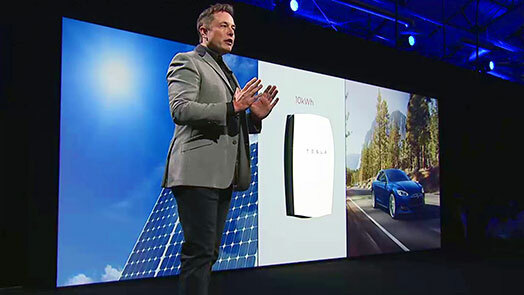 Tesla’s Elon Musk unveils the Powerwall. What if you threw a revolution and nobody came? That is the opposite of fun. When people talk about Elon Musk, adjectives such as fun, merry and entertaining may not be at the tip of the tongue. However, he is poised to throw a party of enormous dimensions for the purpose of growing green energy use. In other words, the technologies behind the new Powerwall batteries are open source and license-free. Let the party commence! Tesla’s Powerwall is the catalyst needed for market-changing grid storage of renewable electricity. Despite the obvious advantages, natural gas providers and electric companies never initiated significant steps to make this happen. When you consider how expensive peak capacity build-outs are that is surprising. Musk is bringing online a $5 billion factory in Nevada to make batteries, 30 percent of which go into Powerwall products. The factory’s mission is reducing production costs as well, which is further impelled by competitors building on their technology. Off-grid storage is estimated to be worth $68 billion by 2024, so there is room for everyone. When you return home in your Tesla, Nissan Leaf, Volkswagen e-Golf SEL, Honda FIT or other brand, forget about plugging into the mains circuit for a recharge. Instead, plug into your Powerwall for a fill-up. As if disrupting the entrenched market dynamic between utilities and homeowners was not enough, Tesla’s 7 kilowatt-hour and 10 kwh Powerwall products are going to have a significant impact for all-electric cars too. The Powerwall stores energy when it is the least expensive when utilities sell off-peak power at lower rates, during the day when solar cells are soaking in sunlight and whenever small-scale wind power is available. The Powerwall 10 kwh version is designed to store energy for backup and the 7 kwh version for daily charge/consumption cycles, which are ideal for charging EVs. Up to 10 units of either version can be daisy-chained to increase capacity. Besides the appeal of using off-grid power, a Powerwall-to-EV transfer avoids the energy loss of an AC-to-DC transfer since it is a DC to DC transfer. Three 7 kwh Powerwalls easily fit in an average garage and could fill up a Nissan Leaf daily with sufficient solar panel generation according to estimates made by Clean Technica. This scenario probably excites so-called “grid defectors” the most, but the efficiency and convenience is just as compelling for homeowners with one or two EVs or businesses with an EV fleet. The Powerwall and storage solutions built on its technology plus the decreasing costs of solar installations are compelling car makers who do not have an EV model, such as BMW and GM, to accelerate their plans to get into the market. Musk’s Tesla cannot drive a green revolution on its own. Musk’s invitation to competitors to share in the vision is proof of that. He is demonstrating that the deficiency of efficient storage capacity on and off-grid is solvable. Even if it is applied only to recharging millions of EVs, it is a tremendous contribution to reducing fossil fuel consumption. The more likely scenario is that Tesla and other party-goers will bring to market many other applications some of which we can only imagine.